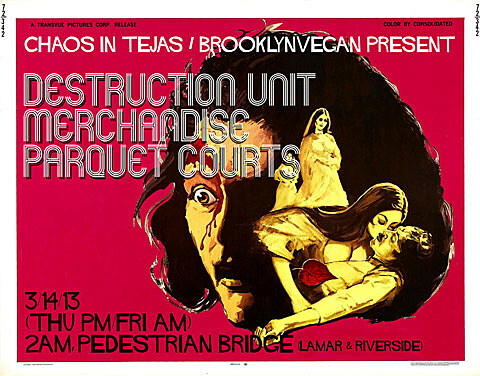 BrooklynVegan & Chaos in Tejas present Destruction Unit, Merchandise and Parquet Courts… on a bridge! SXSW is in ful, nutty swing and and while we’ve already announced our slate of official nighttime showcases and day parties, we’ve got one more for ya. BrooklynVegan and Chaos in Tejas are proud to present tonight, March 14 (technically 3/15 in the AM) a show on the Pedestrian Bridge (Lamar & Riverside) featuring sets from Destruction Unit, Merchandise and Parquet Courts. The FREE, all-ages show kicks off at 2AM. Get there! In addition to this, Chaos in Tejas have quite a few shows of their own during SXSW as well. Meanwhile, our free Thursday day party at The Main and The Jr. starts at noon CDT, and kick off with sets from Jacco Gardner and Single mothers. If you’re in Austin, stop by!